Everyone knows cigarettes are extremely dangerous and addictive. An American researcher wanted to also draw attention to how infectious the tobacco in cigarettes is, as the substance is laden with bacteria. In fact, there is so much bacteria present in tobacco, Amy Sapkoto believes the number of germs could certainly be compared to the number of toxic chemicals and carcinogens that have been isolated. Environmental scientist from the University of Maryland, Amy Sapkota, conducted a study that looked at the bacteria found in tobacco and whether or not these bacteria could possibly be a source of infection for a person who comes in contact with it. Sapkota conjectured that simply touching a cigarette or putting one unlit in the mouth can encourage an impairment of bodily functions. The researchers examined the genetic makeup of the bacteria they were able to isolate from the tobacco under sterile conditions. 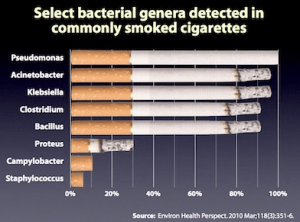 The genetic material of almost 800 different bacteria was compared to the bacteria in the four most smoked brands of cigarettes in Western countries: Marlboro Red, Camel, Kool Filter Kings, and Lucky Strike Original Red. Sapkota doesn’t heed attention to claims that a burning cigarette would kill any bacteria present in the tobacco. Instead, she theorizes that the cigarette smoke picks up bacteria as it is inhaled, and deposits it into the smoker’s lungs. From here, the bacteria thrives and contributes to the formation of disease. This entry was posted in Smoking Facts and tagged bacteria exposure, campylobacter, cigarette addiction, cigarette bacteria, cigarette carcinogens, clostridium, corynebacterium, e coli, infections, klebsiella, pseudomonas aeruginosa, smoking and pneumonia, staphylococcus, stenotrophomonas maltophilia, toxic chemicals on July 15, 2011 by erin_legg.